The State of Connecticut has had some significant renewable power initiatives recently, with the commissioning of the state's largest solar power system and the Bridgeport Fuel Cell Park, the largest fuel cell power project in the U.S. (located on a reclaimed brownfield) coming online. When utility company Dominion Resources brought the Somers solar and Bridgeport fuel cell projects on line in December 2013-both in Connecticut-they marked milestones in renewable energy in the state. At roughly five megawatts, the Somers Solar Center in the town of Somers, Connecticut, was the largest photovoltaic system in the state when it was commissioned. 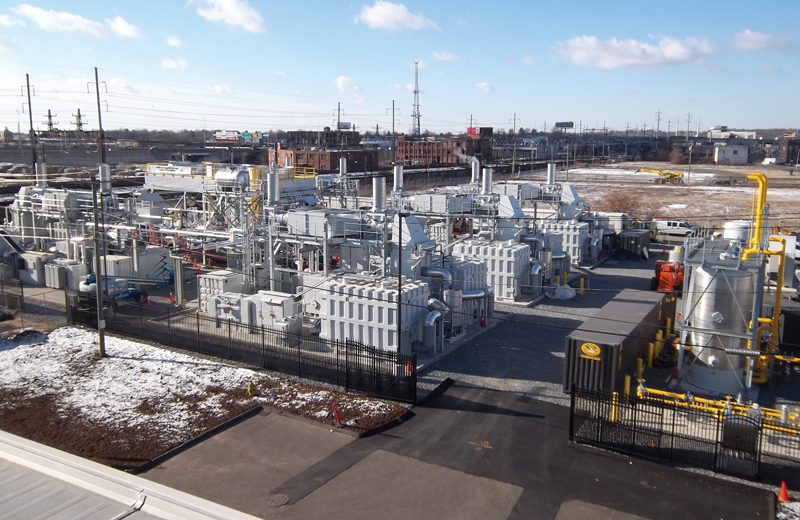 And at 14.9 MW, the Bridgeport Fuel Cell Park in the state's largest city, Bridgeport, was the largest project of its type in the entire United States at commissioning. Both projects started up on time and on budget at about the same time, which took collaboration, scheduling, and communication among all of the parties involved, said Jim Eck, vice president of business development for Dominion Resources. In fact, those projects were just two of several nationwide that Richmond, Virginia-based Dominion had in the works during the same period. "We have a significant number of talented construction, engineering, and operating team members that have experience, and we can deploy them to oversee these operations," Eck said. "We had teams overseeing and managing the construction of Indiana and Georgia solar projects as well as projects we had ongoing here in Virginia. We just have a depth of talent." The Bridgeport fuel cell and Somers solar projects are also part of Dominion's larger goal to develop power generation projects in and beyond the mid-Atlantic region-where it is a regulated utility focused on serving its direct customers. "We're always looking at opportunities to expand and diversify our portfolio for generation, so we will continue to look at opportunities that present themselves to us for consideration," Eck said. "These projects expand our portfolio for contracted generation under a PPA (power purchase agreement). That's important to us and for Dominion investors so that we have confidence that these facilities will deliver anticipated revenues." The $125 million Bridgeport Fuel Cell Park had its origins with the Project 150 program enacted by the Connecticut Legislature in 2003 and expanded in 2007. The initiative was designed to promote renewable energy projects, that had been difficult to develop without long-term contracts. The legislation required local electric distribution companies to enter into long-term PPAs with a goal of 150 MW of "Class 1" renewable energy. The legislation also created the Clean Energy Finance and Investment Authority - Connecticut Green Bank and the Clean Fund. The fuel cell park was part of the fund's third round of financing, receiving a $5.8 million loan. "We provided sort of the tail-end financing to finish the deal and get it across the finish line," said David Goldberg, director of government and external relations for the authority and Clean Fund. "What this project (and the support by the Connecticut Green Bank) does, is it demonstrates the ability to leverage private capital in support of Connecticut clean energy goals, while also supporting local development. We're very excited to be involved in this project." In 2009, FuelCell Energy began developing the project and negotiated a 15-year PPA with Connecticut Light & Power Co. for all of the power generated. Based in Danbury, Connecticut, the firm also worked with the city of Bridgeport to locate leasable land that would be acceptable to the city and close enough to transmission lines to simplify grid connections. "The local community has to be supportive-that's critical-and notjust be a bystander," Eck said. "They have to be an advocate and want this generating [facility] in their community." He gave FuelCell Energy high marks for its work on the ground and said Dominion received a "very warm welcome" from the community. The two-acre site in downtown Bridgeport was on a long-vacant reclaimed brownfield. It did not flood during Hurricane Sandy in October 2012 and was close to Southern Connecticut Gas pipelines carrying natural gas, which served as the hydrogen source. Through a complex electrochemical process, fuel cells generate power when a fuel source is combined with oxygen to produce heat, water, and electricity. The facility captures the waste heat to increase its output and efficiency, Eck said. It also produces a fraction of the emissions when compared to a traditional uncontrolled coal-fueled facility. Each of the five DF3000 fuel cell power plants is roughly the size of a tennis court and generates 2.8 MW, for a total of 14 MW. FuelCell Energy had to carefully orchestrate the delivery of the components to the two-acre site in downtown Bridgeport because they were oversized and needed special escorts to alert road traffic. One of the advantages of developing energy projects in Connecticut is the state siting council has authority for permitting. "They have this organizational body that's been legislated to provide this one-stop shopping to do the siting, so they can be very effective and very efficient in providing state evaluation combined with the local entities," Eck said. "There are still some local permits and environmental permits, but the primary authority to locate and proceed is the siting council." Dominion Resources entered into discussions with FuelCell Energy about possibly acquiring the Bridgeport project in 2011 and finalized the deal in 2012. FuelCell Energy remained the project developer. Eck said Dominion was interested in the project because fuel cell technology has advanced so it is now a viable form of generation. "The technology has gotten to the point where it's gone from the lab to be proven, and it continues to get interest from customers," he said. "We're also interested in fuel cell power as part of the diversity of our generation portfolio in the long run because it brings some unique attributes. Stand-alone power generation with fuel cells is going to continue to be explored by many customers." Clean Fund's Goldberg agreed about the status of fuel cell projects. "Connecticut is a leader in the fuel cell arena and has been supporting development and deployment of fuel cells for decades now," he said. "We do not look at that fuel cell project as an experimental project but a very solid investment for the state of Connecticut." Ground was broken for the project in May 2013. Not only did FuelCell Energy engineer and construct the fuel cell park, but it also manufactured, sold, and installed the five DF3000 fuel cell power plants. In addition, it supplied an organic rankine turbine that converts waste heat from the fuel cells into additional electricity. A/Z Corp., based in North Stonington, Connecticut, acted as the general contractor and used its nearby fabrication and logistics facility to quickly fabricate piping for delivery to the site. Roughly the size of a tennis court, each power plant generates 2.8 MW for a total of 14 MW. By capturing the waste heat, nearly one MW of additional power is generated, Eck said. Torrington to the site, because they were oversized and needed special escorts to alert road traffic. Cranes then lifted each module off the truck and moved it into place. The system was built in stages, with each plant being brought online once it was completed. United Illuminating Co. owns the three substations that receive power from the fuel cell park. The firm also completed an underground electrical interconnection between the park and substations. The park will provide distributed power to part of Bridgeport, creating some benefits of a microgrid. Power reliability continues to be a hot topic as many customers in the area still remember blackouts following Hurricane Sandy. Eck said working with the several different firms required strong commitment from all involved to meet the tight deadlines. "It's important that all of those businesses are integrated and also share the same goal to bring the facility on line and on time," he said. Much of the Somers Solar Center's early development work had been done by HelioSage Energy before Dominion acquired it from CleanPath Ventures, in October 2013. The project had already been permitted to use a single-axis tracking system. Also included in the deal was a 20-year PPA with Connecticut Light & Power Co. for all of the power produced. Milford, Connecticut-based Prime Solutions Inc., which had already been selected by the earlier developers as the engineering, procurement, and construction contractor, continued in that role after Dominion acquired the project. Due to the 180-day construction time frame, Prime Solutions recommended a capacity of slightly less than five MW. This eliminated the need for a lengthy transmission study that ISO New England would have required for a larger project. The smaller system also allowed for a faster approval by Connecticut Light & Power and the ISO operator. The final project comprises four 1-MW Advanced Energy Open TX PowerStations with two AE 500TX inverters per skid. An additional 999-kW AE Open NX Power Station uses three AE 333NX inverters. Designing the system required a coordinated effort between Connecticut Light & Power and the Connecticut Department of Energy and Environmental Protection. 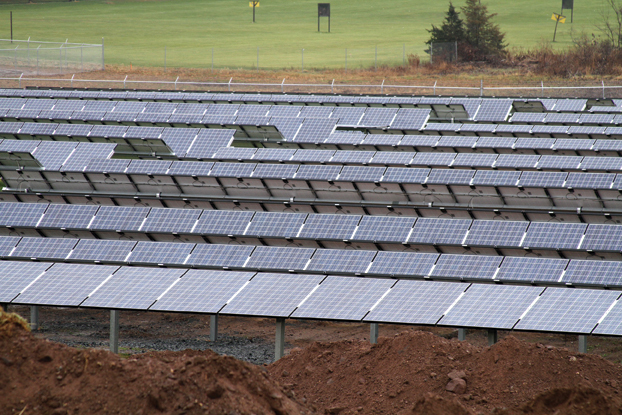 The Somers Solar Center site is 90 acres of leased former farmland in a rural part of north-central Connecticut. The site's rolling topography meant a stormwater management plan had to be developed that included grading restrictions to protect the watershed. The site's rolling topography meant a storm-water management plan had to be developed that included grading restrictions to protect the watershed. In addition, the Connecticut Siting Council imposed limits on tree trimming. Prime Solutions and Array Technologies (the Albuquerque, N.M.-based tracking system manufacturer) had to factor those requisites into the project design to optimize production capacity, minimize shading from the protected tree line, and minimize inter-row shading. To achieve that goal, Prime Solutions went with 32 DuraTrack HZ single-axis trackers from Array Technologies. The project also comprises 23,150 Kyocera KD320GX-LFB solar modules. 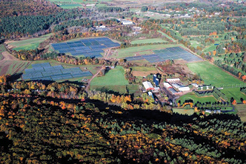 Although the Somers site involves 90 acres of leased former farmland in a rural part of north-central Connecticut, the actual PV system occupies only 50 of those acres. As the EPC, Prime Solutions was also in charge of managing the project logistics. "They needed to be well coordinated in staging of the equipment for this facility to come in on time and on budget for us," Eck said.